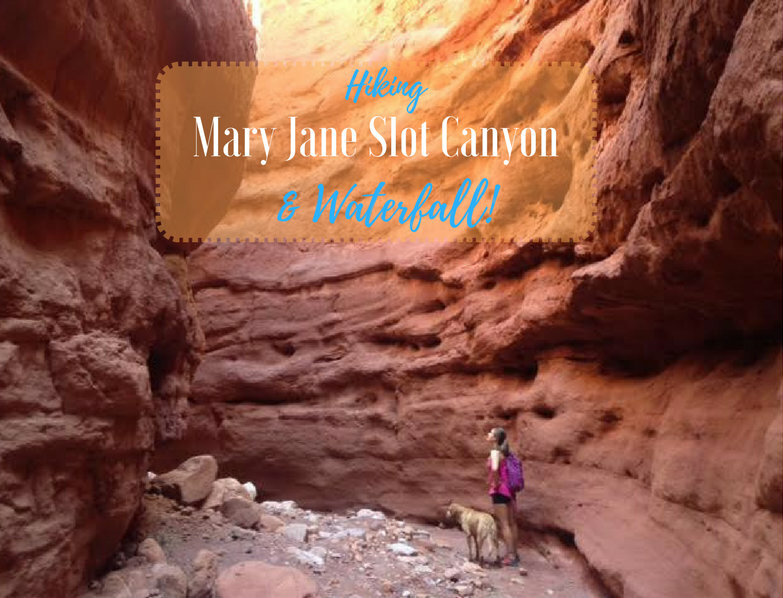 Mary Jane Slot Canyon is one of Moab's hidden gems - the "trail" is a creek the entire way, which leads to a 30 ft waterfall. 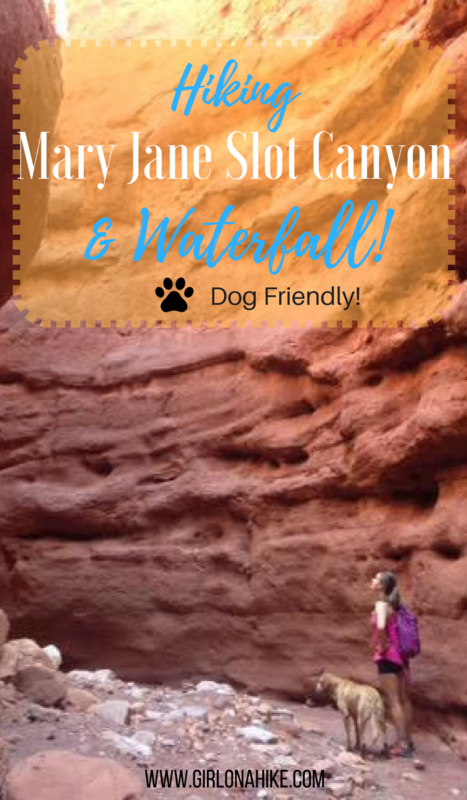 This is a great trail to do when Moab is too hot, and you, the dogs, or kids need to cool off. 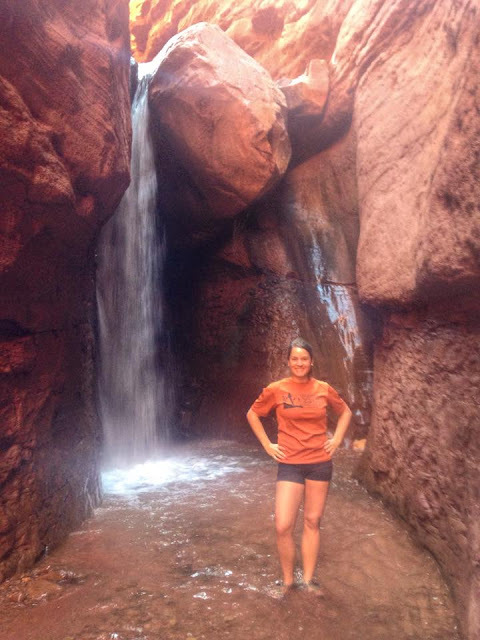 The canyon walls get higher as you hike further into the canyon, and eventually will reach upwards of 100 ft! 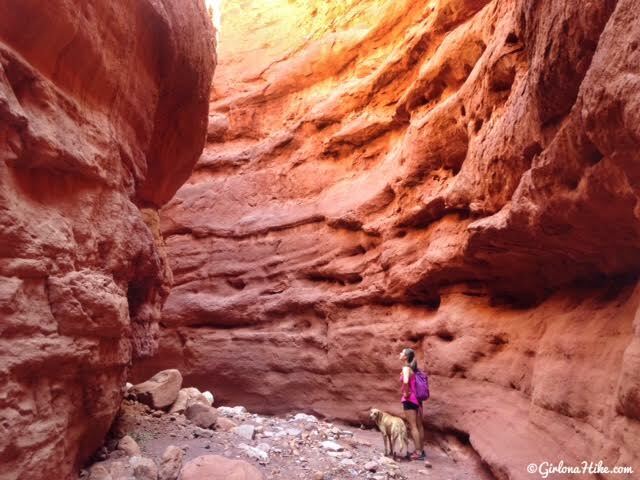 There are several side canyons that allow for exploring tighter slot canyons. 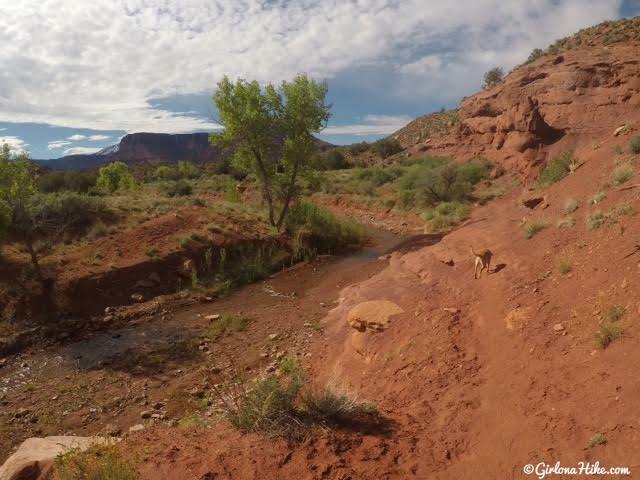 I first hiked this trail in March 2015, and really loved it. I just had to get back to show my friends what it was like! You can check out my original article on KSL here. One warning for Mary Jane Slot Canyon is that, like with any other slot canyon, you do NOT want to hike here during or right after a rainstorm due to the possibility of a flash flood. 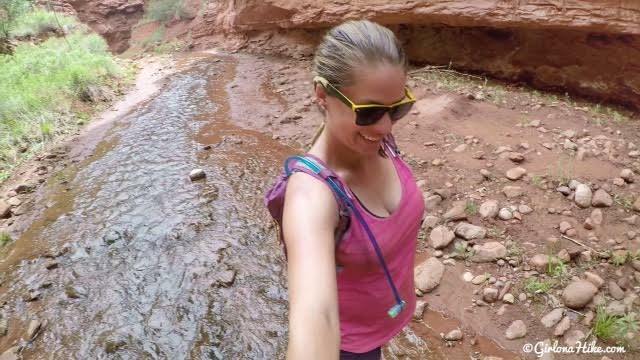 You'll want to wear water shoes for this hike - 90% of the "trail" is hiking through the creek. Use this map if you are driving from Fruita, CO. The drive in. 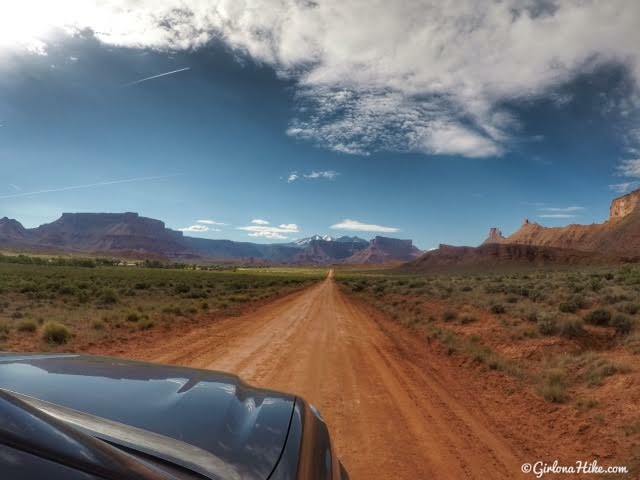 As soon as you turn onto the dirt road you should see a sign "Ranch Road - Dead End" but keep driving and follow the directions. You can see the LaSals peaking out from behind the mesas, and you should be able to see the famous "Priest & Nuns" rock formation to the SW.
We had a Tacoma, but small cars can make it. Our friend was in a Camry and made it just fine, but slowly. The trail starts in the SE corner of the parking lot - do NOT follow the trail head sign for Professor/Sylvester Creek. 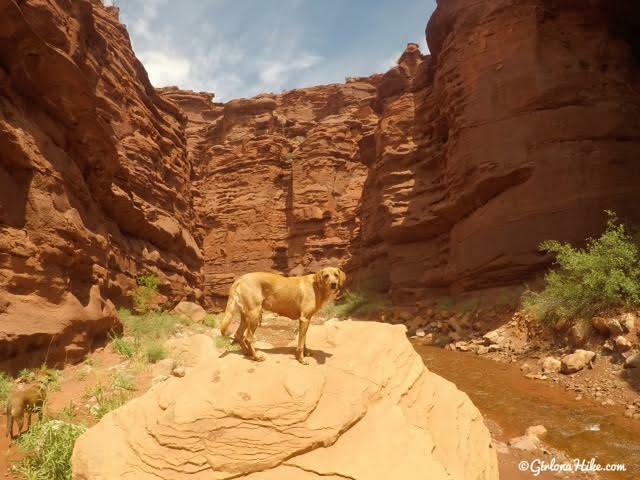 That is another nice trail, but has no shade nor water. 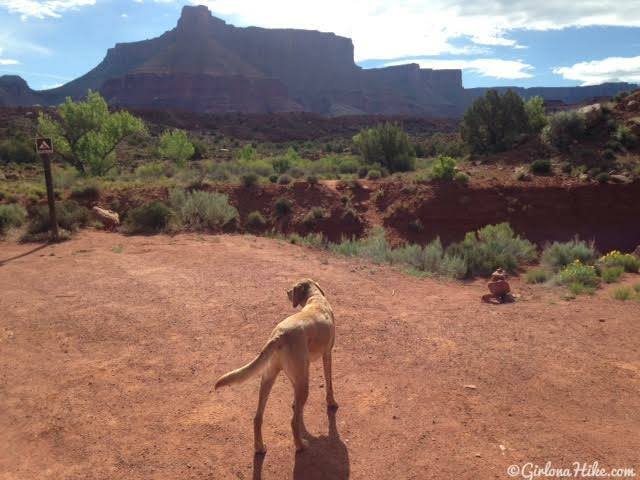 It leads to a pass along a mesa. I hiked that one about 3 years ago, so I don't have a blog post for that trail. Make sure you drop down the little gully (by the no camping sign), then up and over to the other side, following the dirt path. 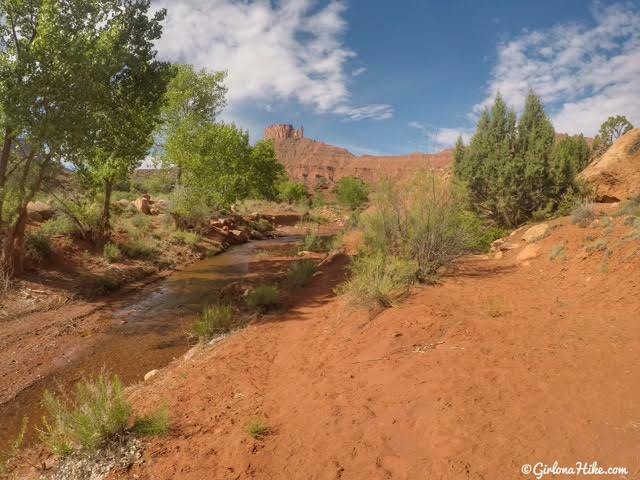 You should see the creek within 5 minutes, and be hiking in a generally SE direction. The entire time the trail will go in and out of the creek. 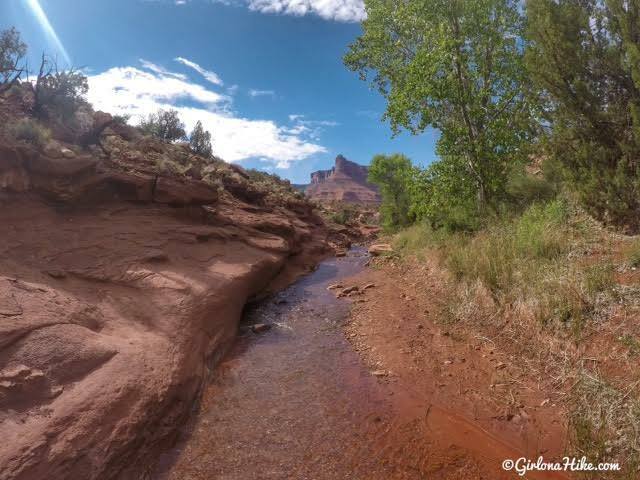 So you could start hiking right away in the creek, or just follow the dry trail for another few hundred feet, and eventually it will force you to hike in the creek. Both ways work and meet up. 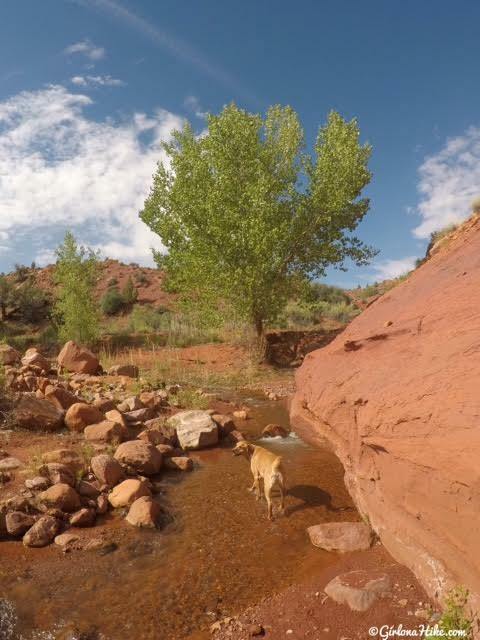 We followed the dry trail for about 10 minutes. 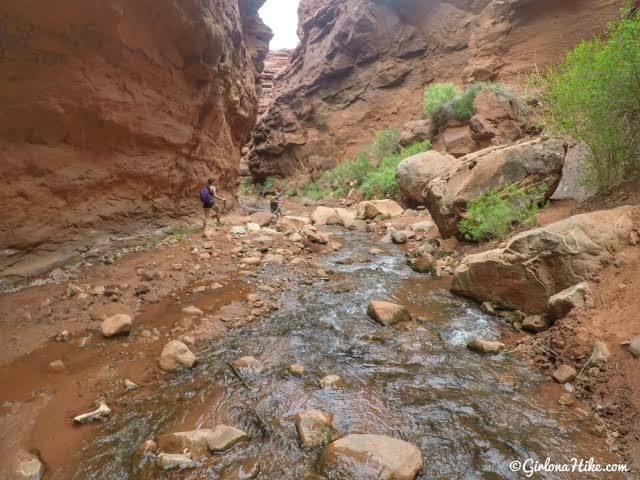 Here is where you are forced to start hiking in the creek, but hey I'm not complaining, that's what we were here for! 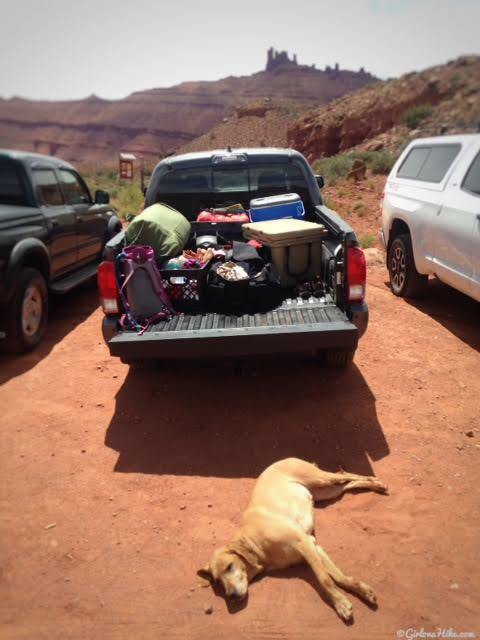 It was only 70F in Moab, but the dogs were already hot. 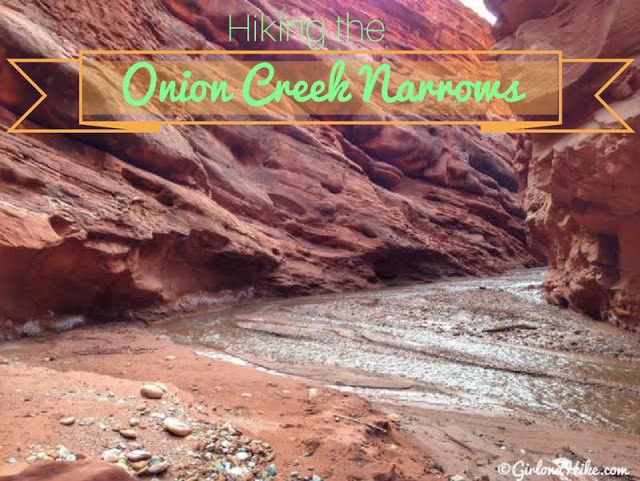 This is a great trail to do year-round since the creek always flows and cools you off. 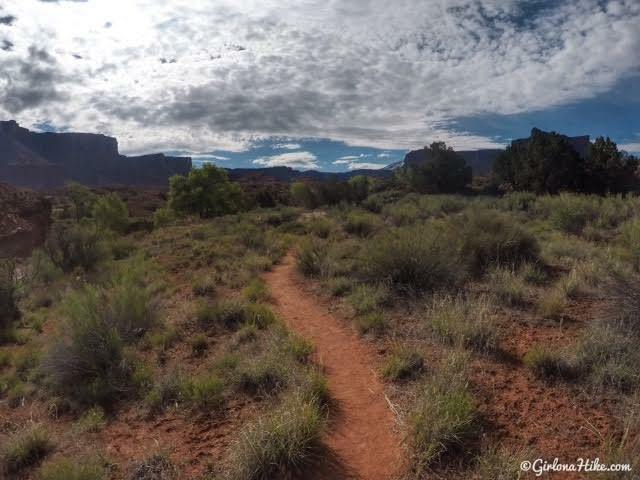 The first mile of the trail is very open, and you can see all of the surrounding mesas and buttes. About 1/2 mile in, make sure you turn left, following the creek. 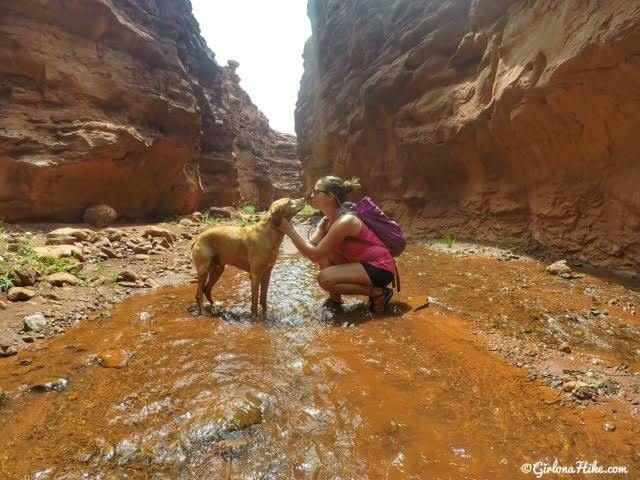 You'll definitely want to wear water/hiking shoes. A few people wore Chacos, Keens, and I wore my Merrell's. 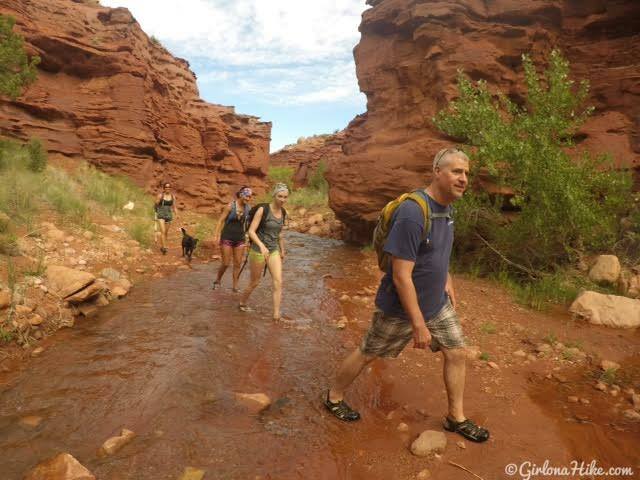 There are a lot of pebbles and rocks in the creek, so it's better if you have fully closed water shoes, like the Merrell's, so you don't have to stop to get the rocks out of your shoes. 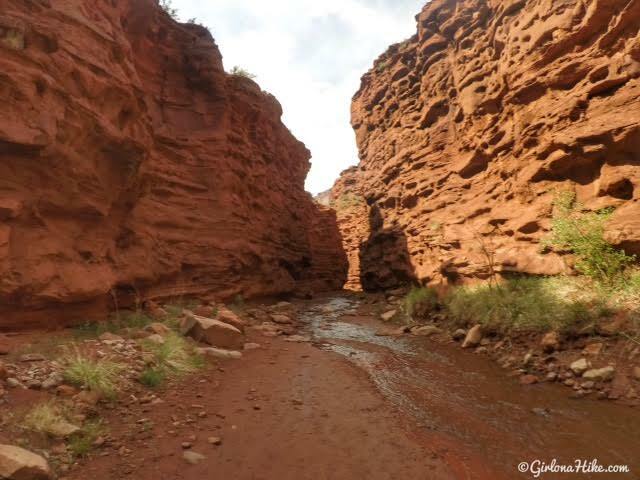 As you continue further up the canyon the walls will get higher and higher. 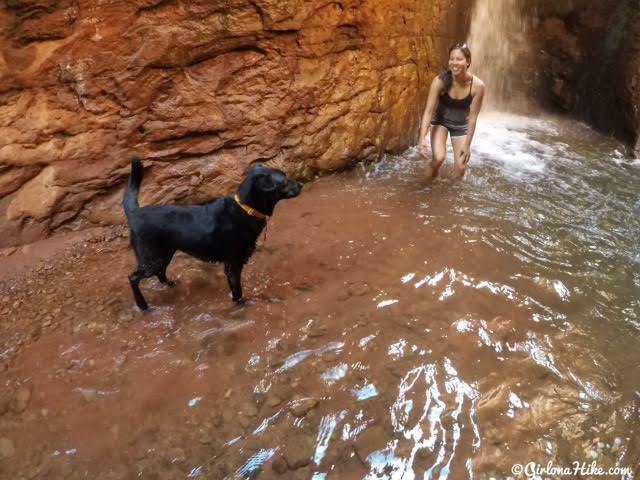 Super happy to be in the creek on a warm day! 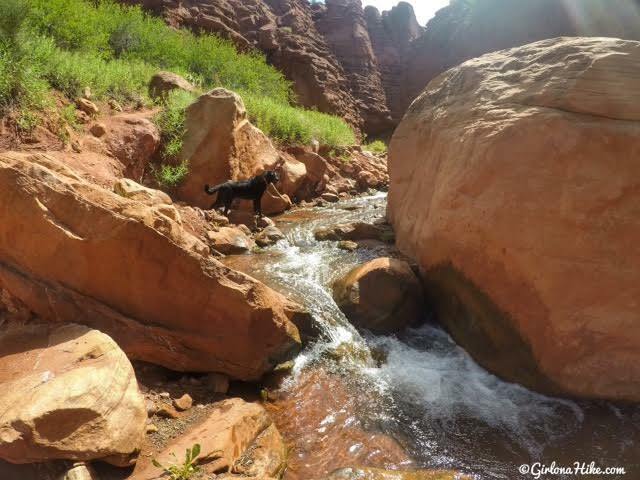 The creek was never more than calf deep. We decided to explore a little side canyon, and it was so cool! The colors were amazing. 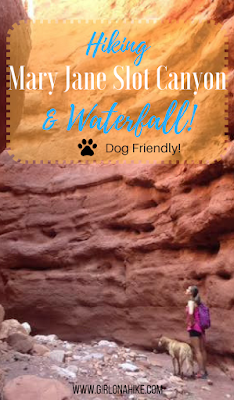 Finally, we reached the Mary Jane slot canyon waterfall! 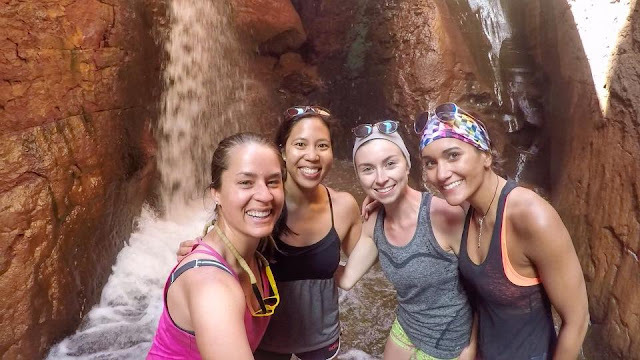 It takes most hikers about 2.5 hours to reach the waterfall. This waterfall is a double-tongued waterfall halted by a chockstone, about 30 feet high. This photo was from the first time I hiked here, back in March 2015. The water level was much lower since we had a dry winter. 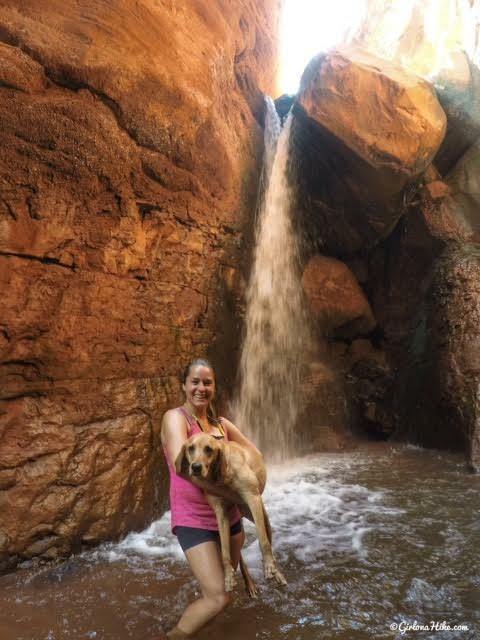 Jax was afraid of the waterfall - he didn't even want to get close to his mom!